After leaving the experiment with fragments (see previous post) in the basement at Roskilde University over Christmas and New Year, it was finally time to go back and see if any of the small fragments of ( Fucus radicans ) has been well behaved ande done what we want them to. 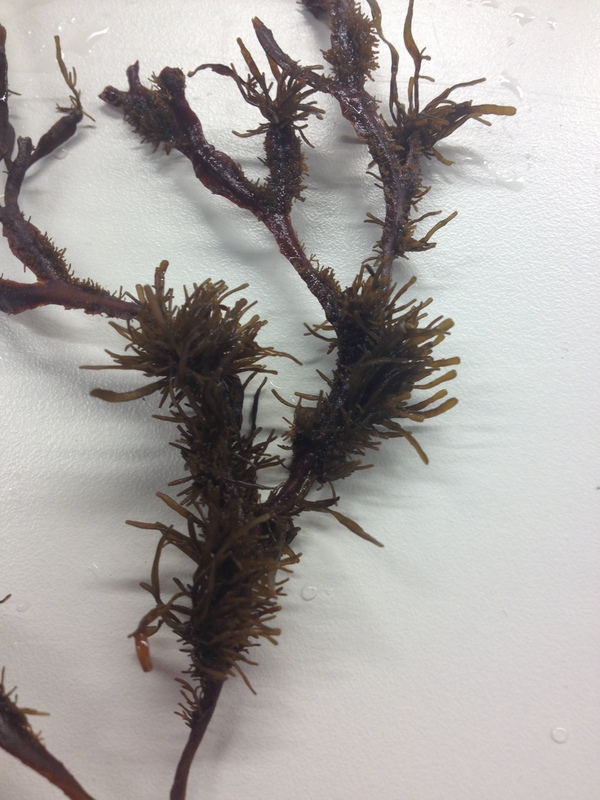 In the ​​Bothnian Sea, the brown macroalgae Fucus radicans has been shown to be up to 80% clonal, something that is unique among seaweed belonging to the Fucus – family. However, it is not unusual for algae to adapt with a more clonal life cycle in brackish environments (salinity between 2-15 parts per thousand) because their sexual reproduction requires the sodium ions (NaCl – sodium chloride) from salt to work (see post about this here). When it was discovered that Fucus radicans was clonal , it could also be described as a separate species. It was previously thought that it was a dwarf morph of Fucus vesiculosus, which is the dominant macroalgae in the Baltic Sea. In order to reproduce clonally, fragments from one individual falls off from the parent plant and then attaches to the bottom again. But under what circumstances does this happen? What are the most favourable conditions for the fragments to re-attach? Should it be on hot summer days or cold winter nights? Once we know this, we can understand more about when Fucus radicans is most sensitive to disturbances in the form of e.g. chemical emissions, eutrophication or construction work that affects the aquatic environment. We hope that our experiment can help to provide a better basis for management decisions concerning the Baltic Sea’s unique and fragile environment. So, how did we set up our experiment? 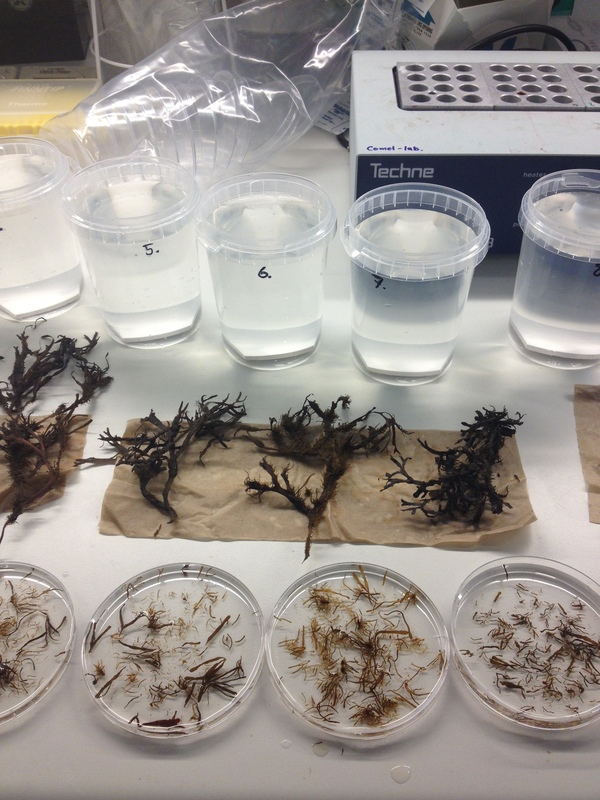 We collected fragments from several plants of seaweed from different sites. Since we can neither afford nor have the time to run genetic tests on them to see that they are not all the same individual, which of course can happen when working with a species that is clonal, we made sure to get both males and females. For a longer story on startup, read the post on our startup HERE. But on this trip it was time for me and my colleague Tiina Salo to do our first reading of the experiment. Research is largely a matter of daring to fail, over and over again. The pile of rejected hypotheses about how one thought it might be is growing rapidly. Guess if we were surprised when our experiment had not only managed to run the whole time period without the electricity shorting out completely (except for some problems in the beginning that Tiina solved). We had results! Two amazed PhD students could not believe their eyes. So after checking all 96 replicates with four small fragments in each jar, I took out the bag with Fucus radicans that I had taken with me from Stockholm and we began to sort 384 new fragments into the jars for another round. In the evening, I saw fragments when I closed my eyes. Now, the second round is getting on and there will be a trip down again for me in early February to finish it, and hopefully get the same result as in our first round. You never know when it comes to seaweed, so keep your fingers crossed.